Located in the Los Angeles Convention Center's West Hall, Nintendo's E3 Expo 2003 booth is the largest of the show. Click to view floor maps of E3 Expo exhibitors located in Concourse Hall , Kentia Hall , Petree Hall , South Hall , and West Hall . Nintendo's highly acclaimed flight simulation game, Pilotwings, will soon make its way to Nintendo GameCube according to a number of reports from reputable industry news sources. The game, rumored to be under development by Rogue Squadron creator Factor 5, could be unveiled as early as next month according to reports. Nintendo of America today officially confirmed that Mario Kart Double Dash will support LAN play via the GameCube Broadband Adapter. The game's description on Nintendo's E3 2003 site now includes the sentence, "Pack eight players into your living room and turn up the fun when you connect two Nintendo GameCubes via the Broadband Adaptor. It's intense action coming soon to 2 screens very near you!" Nintendo's E3 2003 site has revealed a few interesting details regarding F-ZERO GC, including - possibly - the game's official name. A navigation bar on the site's main page briefly displays "F-ZERO GX" when clicked on. Additionally, the site's game description confirms that F-ZERO AC will be released in North America. "When you use a Memory Card with F-Zero Arcade, you can transfer new pilots or machine parts that you can use for customization on your Nintendo GameCube. You can even race your home-built machine in the arcade!" According to Famitsu, this customization includes the selection of cockpit, body, and booster parts that collectively impact every aspect of vehicle performance. "A tale of souls and swords eternally retold." Nintendo.com has posted Soul Calibur II's stunning intro movie for the GameCube. Click to download the low-resolution or high-resolution version of the video. Soul Calibur II will release on GameCube this August. The sequel to Metroid Prime, currently under development at Retro Studios, will be unveiled at the Electronics Entertainment Expo next month according to IGN Cube . The game will be shown on video in Nintendo's booth; it will not be playable. On May 25th, Nintendo will release its first-ever GameCube sampler disc featuring released and unreleased games in playable and movie form. Among the playable games will be Billy Hatcher and the Giant Egg, Sonic Adventure DX, Splinter Cell, and Viewtiful Joe. IGN Cube is also reporting that a playable version of Soul Calibur II may find its way onto the disc as well. The disc will be distributed to buyers of Nintendo GameCube. Nintendo has given no indication as to whether or not the demo disc could later be distributed at retail or as a bonus to Nintendo Power subscribers. 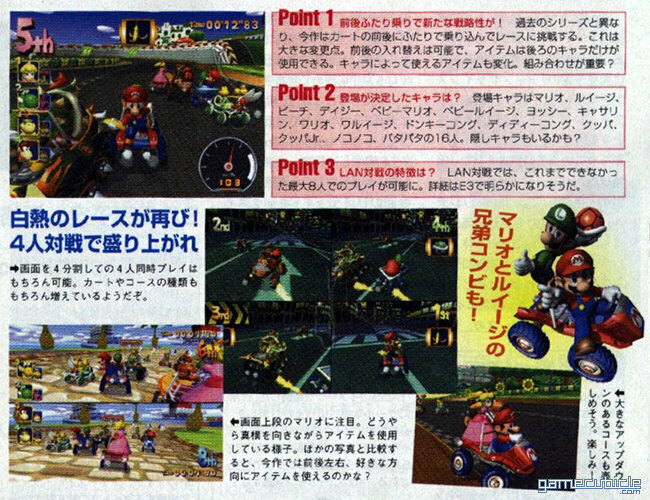 According to unconfirmed reports, Mario Kart GC will support LAN play on Nintendo GameCube - allowing for up to eight players to compete simultaneously on two connected consoles. It's not known whether LAN support will be facilitated by the GameCube Broadband Adapter or via the long-rumored GameCube wireless connectivity device that Nintendo may be set to unveil at the Electronic Entertainment Expo in May. GameCubicle will have any additional information as becomes available. Matsushita, maker of the GameCube / DVD hybrid named Q, is developing its own variation of the Game Boy Player for Q owners. The GameCube peripheral, which Nintendo released in Japan in March, is not compatible with the Q. No word yet on when Matsushita will release the new peripheral. Atari today announced that the much-anticipated hit Japanese game Ikaruga for the Nintendo GameCube next generation console system has shipped to retail. "Ikaruga delivers addictive gameplay combined with intense firepower that loyal fans of the shooter genre have come to expect," said Nancy MacIntyre, Vice President of Marketing for Infogrames Beverly studio. "With a phenomenal reputation that precedes it, Ikaruga is the import core gamers have been waiting for and more." Video game news site, The Magic Box , is reporting that a GameCube version of Shantae is currently in development at WayForward Technologies. The action side-scroller, featuring a dancing girl genie, gained wide acclaim when it was released on Game Boy Color in June, 2002. No gameplay or release details are currently known. On May 25th, Nintendo will release its first-ever GameCube sampler disc featuring current and future games in playable and movie form. The disc will initially be distributed to new buyers of Nintendo GameCube. No official word yet on whether or not the demo disc will later be distributed at retail or as a bonus to Nintendo Power subscribers. Nintendo today announced it has named Michael Kelbaugh as the new president of Retro Studios. Based in Austin, Texas and owned by Nintendo Co. Ltd., Retro Studios is best known for its award-winning title Metroid Prime released for the Nintendo GameCube in November 2002. Retro is currently at work on the highly anticipated sequel to Metroid Prime. Prior to joining Retro Studios, Kelbaugh spent 15 years at Nintendo of America's corporate offices in Redmond, Washington. He most recently held the position of director in Nintendo's business development group. Kelbaugh replaces Steve Barcia, Retro's former president. Beginning May 4th, buyers of Nintendo GameCube can sail away with a free copy of The Legend of Zelda: The Wind Waker as part of the $149 'Buy a Nintendo GameCube, Get a Free Game' promotion that Nintendo introduced in February. Currently, GameCube buyers have the option of Mario Party 4, Metroid Prime, Resident Evil Ø, or Star Fox Adventures as a free game with their console purchase. The promotion is set to last through July. Nintendo Co. Ltd. today announced that in March, the company adjusted its GameCube royalty rate structure in bid to remain competitive with Microsoft and Sony in attracting the support of third-party publishers. "Before our royalty rate was a little more aggressive so to the third party publisher it was a little less attractive to make games for GameCube," George Harrison, Senior VP of Marketing for Nintendo of America explained to Reuters. "The biggest games of the year last year were games like GTA and they came from an independent publisher. We need to make sure that we have good relationships with all the independent publishers, because you never know where the next big hit game is going to come from." IGN Cube is reporting the new rate structure to be approximately as follows. Publishers must pay a licensing fee of $10 to Nintendo for games with a $50 MSRP, $8.50 for $40 games, $7 for $30 games, and $5.50 for $20 games. Nintendo Co. Ltd. today cut its earnings estimates for the fiscal year ended March 31, 2003. The company now expects earnings for the year to total ¥66 billion ($547m), significantly lower than earlier forecasts of ¥80 billion ($663m). In addition, Nintendo cut its sales estimates for the year to ¥500 billion ($4.1b) from ¥600 billion ($5b). Unimpressive sales of Nintendo GameCube stood out as the leading cuplrit for Nintendo's earnings shortfall. GameCube sales totaled just 5.6 million units in the year, well short of previously revised estimates of 10 million. GameCubicle has updated Ikaruga's media gallery with exclusive hand-drawn concept art from the creators of Ikaruga. The story of Shinra's battle with Horai will soon come to life on GameCube when Ikaruga is released on April 15th. Find some sharp new screen captures and renders of ships and bosses from the highly-anticipated aerial fighter, Ikaruga. The story of Shinra's battle with Horai will soon come to life on GameCube when Ikaruga is released on April 15th. Since the launch of GameCube, Nintendo and Capcom have had extremely close ties. Firstly, with the Resident Evil series becoming GameCube-exclusive and more recently with the unveiling of the "Capcom 5." However, in an apparent re-evaluation of their support for GameCube, the Nikkei Business Daily, a respected Japanese newspaper, is reporting that Capcom now wishes to distance itself from GameCube-exclusivity in the coming year. Capcom cited disappointing GameCube hardware sales worldwide as the key motivating factor in their decision. As a result, Resident Evil 4 will be the last GameCube-exclusive game in the series. Nikkei went on to report that Capcom will place a greater focus on development of games for PlayStation 2 and Xbox in the future.